The next meeting of the Front Range UNIX Users Group (FRUUG) will be at 5:15 P.M. on Thursday, October 26 at the CU Engineering Center, room ECCR-245. Thanks to Dirk Grunwald of the CU Computer Science Department for co-hosting this meeting. Why the new time? Metered parking on the north and south sides of the Engineering Center becomes available to the public at 5:00. With the late starting time, we'll begin the meeting promptly. More details are in Meeting Location (below). Test launch of the driftsonde in Wyoming, summer of 2006. Photo by JoeVanAndel, courtesy of and copyright by UCAR. The eastern tropical Atlantic ocean is the breeding ground for the hurricanes that hit the U.S. Gulf coast and the eastern seaboard, and we don't know nearly enough about it. The area is out of range for our hurricane-monitoring aircraft, and forecasters don't have enough data to predict which disturbances will turn into hurricanes. That's where the driftsonde project comes in. Joe VanAndel, long-time FRUUG Executive Committee member and programmer at the National Center for Atmospheric Research (NCAR) was involved in a collaboration between NCAR, the French Space Agency (CNES) and the French National Center for Scientific Research (CNRS) to develop and field driftsondes. This team of scientists and engineers launched weather balloons from Niger, Africa. The weather balloons drifted west towards the Caribbean and released dropsondes to measure atmospheric conditions. Joe will give an overview of the driftsonde project, including how NCAR used a tiny Linux computer to control and monitor the driftsonde, consisting of a stratospheric balloon, a gondola, and an instrument package. He'll describe how NCAR monitored and controlled the gondola using an Iridium satellite link. In addition, he'll present a case study of how he used Python on the gondola computer to reprogram the equipment — in the middle of a flight. Some of the challenges: each sonde had to have its own heater, wrapped around its battery. The gondola supplied power to the sonde heater, until the sonde's battery was warm enough to produce enough voltage to power the sonde. It was almost like "jump starting" the sonde at 20,000 meters at temperatures of -70C. 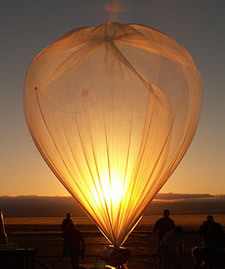 http://www.eol.ucar.edu/projects/thorpex-amma/images/Driftsonde_Flight_1.wmv for a movie of a balloon launch. If this isn't interesting enough, Joe will be bringing a gondola, an Iridium modum, the electronics stack, and some sondes (including the much larger ones that are currently dropped from aircraft). Joe VanAndel is a programmer in the Earth Observing Laboratory of NCAR. He typically writes software to process and display data from weather radars, and he enjoys programming in Python. Joe is a member of the FRUUG Executive Committee. In his spare time, he enjoys bicycling, digital photography, and working with Flatirons Habitat for Humanity. As you probably know by now, the CU Academic Computing center seminar room that we used for more than a decade is no longer available to us, so we've been checking out some potential new meeting places, the CU Engineering Center being one of them. We've changed the meeting time to accommodate traffic and parking on campus, and hopefully it will allow more people to attend. We'll also be announcing these meetings through the CU Computer Science department, and we'll hopefully gain some synergy with the university as a result. Let us know what you think via the alias "feedback" at the domain fruug.org. This meeting will be held the Engineering Center Class Room wing, room 245, or ECCR-245. This wing is on the southwest corner of the CU Engineering Center, located at the corner of Colorado Boulevard and Regent Drive (see map below). There is parking available on the north and the south sides of the building. Last we checked it becomes free at 5:00, hence the 5:15 meeting start time. (Please double check the meters before you park). An Open Web Application Security Project (OWASP) chapter is being started in Denver. OWASP's goal is to provide education to developers and security professionals on security issues in Web-based applications. Their first meeting is scheduled for November 15. For more information please refer to: http://www.owasp.org/index.php/Denver. At our last meeting, a joint one with the Front Range OpenSolaris User Group (FROSUG), Stu Maybee of Sun Microsystems presented the current state of Xen, virtualization technology that Sun is integrating with OpenSolaris. Remember that your FRUUG membership entitles you to discounts on your book orders from Addison Wesley/Prentice Hall, IBM Press, O'Reilly & Associates, New Riders, No Starch, Paraglyph, PC Publishing, Pragmatic Bookshelf, SitePoint, and Syngress; refer to the FRUUG Web site library page for details.